The free flow of information is one of the basic tenets of liberty. Today, we rely on the Internet to access information. Currently, our trust in the accessibility of information over the Internet and the Web depends on benign and unbiased administration of centralized search engines. Unfortunately, centralized systems rely on one or a few nodes that can be easily subverted to censor information. In this NSF research project, we have developed a distributed and decentralized publication, search and retrieval system, named iTrust. Our initial implementation of iTrust, based on the HyperText Transfer Protocol (HTTP), is most appropriate for desktop or laptop computers on the Internet. However, today, many people use mobile phones to organize their activities and, in many countries, mobile phones are the only computing platform generally available. Consequently, we have developed a version of iTrust for mobile phones using the Short Message Service (SMS). To guard against the risk that both the Internet and the cellular telephony infrastructure are disabled, we have developed a Wi-Fi Direct version of iTrust for mobile ad-hoc networks. Mobile phones or tablets enabled with Wi-Fi Direct can share information directly, without the need for wireless access points or cellular network connections. Thus, with iTrust, users can decide which kind of network is most appropriate for their current needs, and they can share information without reliance on, or interference from, a third party. Figure 1 illustrates the different kinds of networks over which iTrust operates. Figure 1. 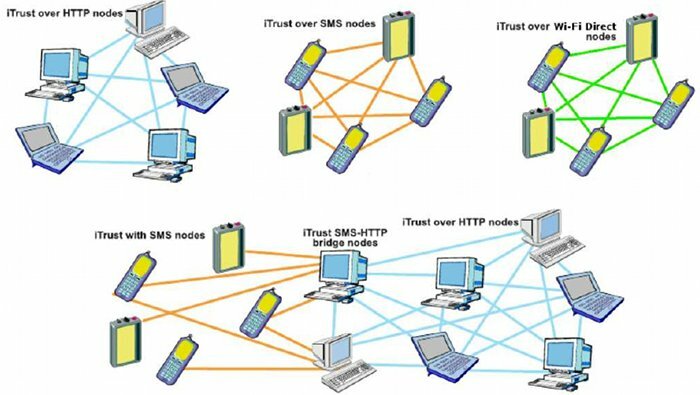 The iTrust networks, showing the iTrust over HTTP nodes, the iTrust over SMS nodes, the iTrust over Wi-Fi Direct nodes, the iTrust with SMS nodes, and the iTrust SMS-HTTP bridge nodes, publishing, searching for, and retrieving information. The iTrust network is an unstructured network in which all nodes are equal. Some of the nodes, the source nodes, produce information, and make that information available to other participating nodes. The source nodes also produce metadata that describes their information. A source node distributes the metadata, together with the address of the information, to a subset of the participating nodes chosen at random. Other nodes, the requesting nodes, request and retrieve information. Such a node generates requests that contain keywords, and distributes its request to a subset of other participating nodes chosen at random. Nodes that receive a request compare the keywords in the request with the metadata they hold. If a node finds a match, which we call an encounter, the matching node returns the address of the associated information to the requesting node. The requesting node then uses the address to retrieve the information from the source node. Figure 2 illustrates the basic concept of iTrust. Figure 2. At the left, a source node distributes metadata, describing its information, to randomly selected nodes in the network. In the middle, a requesting node distributes its request to randomly selected nodes in the network. One of the nodes has both the metadata and the request and an encounter occurs. At the right, a node matches the metadata and the request and reports the match to the requester, which then retrieves the information from the source node. The intellectual merit of the iTrust publication, search and retrieval system lies, in part, in its distributed and decentralized nature, and its objective to support the sharing of information without fear of censorship. It also lies in its probabilistic nature and its distribution of both the metadata and the requests (queries) to randomly chosen nodes in the network. The intellectual merit of iTrust also lies in its statistical algorithms for detecting and defending against malicious nodes in the iTrust network. Using the chi-squared statistic and the exponential weighted moving average, the novel statistical detection algorithm estimates the proportion of subverted or non-operational nodes in the iTrust network. The novel defensive adaptation algorithm then increases the number of nodes to which the requests are distributed to maintain the same probability of a match as when all of the nodes are operational. The intellectual merit of iTrust also lies in its adaptive membership protocol, which exploits the messages that are already being sent to distribute metadata or requests, thus reducing the need for additional messages. The novel adaptive membership protocol estimates the membership churn, i.e., the nodes joining or leaving the membership, based on the responses that a node receives to its requests. The node then dynamically adjusts the number of nodes to which it sends metadata and requests to compensate for the changing membership. The most significant broader impact of iTrust is societal. The free flow of information is the primary determinant of a free and democratic society. The free flow of information discourages small groups of people from trying to abuse the government, the economy or the environment for their own personal gain. Many research projects provide benefits to individuals, but it is rare for a research project to provide benefits to society as a whole. More specifically, the benefits of iTrust include the ability to create mobile ad-hoc networks using Wi-Fi Direct, which can be of substantial benefit in less developed countries of the world. Distributed membership algorithms have benefits for many modern networked computer systems. The ability to detect malicious attacks indirectly by statistical inference has substantial benefits for many distributed systems. Additional information on iTrust can be found in the publications, presentations, source code and documentation listed below. L. E. Moser and P. M. Melliar-Smith, Proceedings of the International Conference on Information Networking 2014, Phuket, Thailand (February 2014), 340--345. L. E. Moser and P. M. Melliar-Smith, Proceedings of the IEEE International Conference on Computer Communications and Networks, Nassau, Bahamas (July-August 2013). W. Dai, L. E. Moser, P. M. Melliar-Smith, I. Michel Lombera and Y. T. Chuang, Proceedings of the 2013 International Conference on Wireless Networks, Las Vegas, NV (July 2013), 162-168. I. Michel Lombera, L. E. Moser, P. M. Melliar-Smith and Y. T. Chuang, Proceedings of the 2013 International Symposium on Wireless Personal Multimedia Communications, Atlantic City, NJ (June 2013). B. Peng, L. E. Moser, P. M. Melliar-Smith, Y. T. Chuang and I. Michel Lombera, Proceedings of the 9th International Conference on Web Information Systems and Technologies, Aachen, Germany (May 2013), 199-208. I. Michel Lombera, L. E. Moser, P. M. Melliar-Smith and Y. T. Chuang, ACM Mobile Networks and Applications Journal, vol. 18, no. 1 (February 2013), 22-41. I. Michel Lombera, L. E. Moser, P. M. Melliar-Smith and Y. T. Chuang, Proceedings of the IEEE 8th International Conference on Wireless and Mobile Computing, Networking and Communications, Barcelona, Spain (October 2012), 134-141. Y. T. Chuang, I. Michel Lombera, P. M. Melliar-Smith and L. E. Moser, Journal of Computing Science and Engineering, vol. 6, no. 3 (September 2012), 179-192. I. Michel Lombera, L. E. Moser, P. M. Melliar-Smith and Y. T. Chuang, Proceedings of the IEEE 1st International Conference on Mobile Services, Honolulu, HI (June 2012), 72-79. C. M. Badger, L. E. Moser, P. M. Melliar-Smith, I. Michel Lombera and Y. T. Chuang, Proceedings of the 8th International Conference on Web Information Systems and Technologies, Porto, Portugal (April 2012), 312-322. P. M. Melliar-Smith, L. E. Moser, I. Michel Lombera and Y. T. Chuang, Proceedings of the 13th International Conference on Distributed Computing and Networking, Hong Kong, China (January 2012), Lecture Notes in Computer Science, vol. 7129, Springer, 351-366. I. Michel Lombera, Y. T. Chuang, L. E. Moser and P. M. Melliar-Smith, Proceedings of the 3rd International Conference on Mobile Computing, Applications, and Services, Los Angeles, CA (October 2011), 152-171. Y. T. Chuang, I. Michel Lombera, L. E. Moser and P. M. Melliar-Smith, Proceedings of the 2011 International Conference on Internet Computing, Las Vegas, NV (July 2011), 169-175. I. Michel Lombera, Y. T. Chuang, P. M. Melliar-Smith and L. E. Moser, Proceedings of the Third International Conference on the Evolving Internet, Luxembourg City, Luxembourg (June 2011), 7-13. University of California, Santa Barbara, June 2013. Manual for using iTrust over HTTP. Manual for using iTrust over SMS and iTrust over Wi-Fi Direct. Source code for iTrust over HTTP. Download and install this code to access the iTrust over HTTP network. An Android app for iTrust over SMS. Download from your mobile device Web browser, then tap the downloaded file to auto install (must have 'Install from 3rd parties' enabled in Android). If you just want to use the iTrust over SMS network, then all you need is this app. Source code for iTrust over SMS. Download and read to see the source code for iTrust over SMS. You do NOT need this code if you just want to access the iTrust over SMS network (instead, download Android app above). An Android library for iTrust over Wi-Fi Direct. Include this code in your Android apps to gain Wi-Fi Direct capabilities in P2P messaging. You may have to rebuild this code as a library (not project) depending on your Android version. This research supported in part by NSF CNS 10-16193.